America’s #1 organizer teams up with her daughter to give teens a foolproof method for getting organized in every aspect of their lives. Today’s teens are busier than ever. Figuring out how to balance schoolwork, friends, and extracurricular activities can often feel as difficult as performing a high-wire act without a net. And many teens become even more frustrated by the remedies the adults in their lives prescribe: even if teens would like to see their floors or finish their homework occasionally, they don’t want to do that by throwing away their stuff or spending less time with their friends. Instead, they want to figure out a way to make the most of their space and time—which is precisely what Julie Morgenstern and her teenage daughter, Jessi Morgenstern-Colón, offer. 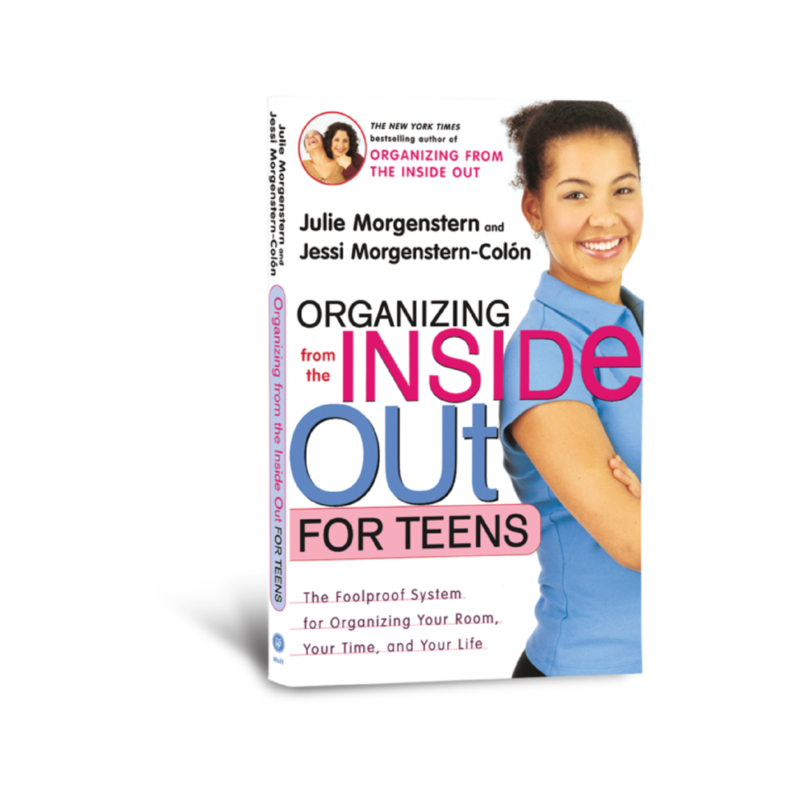 With quizzes, lists of useful organizational resources, and advice from other teens around the country, Organizing from the Inside Out for Teens will prove an indispensable guide for overwhelmed teenagers everywhere. If you're reading this book, chances are that you think you are a disorganized person (or someone you know thinks you are). You've been sometimes lovingly, and other times scoldingly, referred to as a slob, mess-aholic, or pack rat. We're going to bust a lot of myths about getting organized, and here is the first one. Organizing is not about discipline. It's about design. If your system is a custom fit for you, maintaining it will be a breeze. You don't have to change who you are to get organized. You have to work with your natural habits and goals. You design the system to support you, not to change you. Myth: Organizing is the same as being neat. Fact: Organizing is not about how a space looks, but how it functions. In the game of organization, substance is what matters, not style. Many people keep their rooms looking so neat and clean, you'd think you could eat off their floor. However, when push comes to shove, they can never find anything--because inside their drawers and closets, it's utter chaos. Others have rooms that are all piles, a stack of papers here, a mountain of clothes there, but when it's time to look for something they need, they can find it within seconds. Messy does not equal disorganized. It doesn't matter if people think that your room looks like a disaster area. Here's the definition of organizing this book is based on: If you know where your stuff is, are able to find what you need when you need it, and are comfortablein your space, then you're organized! If you're happy with your schedule and comfortable with where your time is spent, then you are a good time manager. In that case you probably don't even need to read any further. But be honest with yourself. Take the following self-assessment to see if your piles are a help or a hindrance and if you're really as organized as you'd like to be. 1. True False I can find anything I need in two minutes or less. 2. T F I feel in control of my space, time, and papers. 3. T F Cleanup is quick because I know where everything goes. 4. T F I am rarely late. 5. T F I hardly ever lose things. 6. T F Getting ready to go out is a smooth process. 7. T F Procrastination is rarely a problem for me. 8. T F I get my homework done on time and am pleased with the results. 9. T F I feel happy with what I accomplish every day. 10. T F I rarely hear myself apologizing for how my room looks. 11. T F I am comfortable in my space. 12. T F I don’t think being disorganized is an obstacle to my success. If you answered "false" to three or more of the above questions, keep reading. This book was written expressly for you. It will teach you how to organize your life so that you can succeed in all your goals and still find enough time to enjoy yourself.